My first time at Duo, I got the Buddha roll- fantastico. My second time, I got the sweet and sour roll... enh. However, that second time, WE GOT THE CHOCOLATE DESSERT. Yes I am shouting at you. I want you to hear me. It's the best dessert I've ever had. Capriccio's lemon cake is great, but that's casual. This dessert is FANCY. AND DELICIOUS. (But only 9 bucks!) If you have ever had the Chocolate Molten Cake at Morton's, let me tell you, this matches their molten cake and does it one better by adding a chunk of hazelnut mousse and scoop of strawberry sorbet. Side note: If you are a single woman, go to Morton's around 6pm on any day of the week, sit at the bar, and be near 50 men, some of whom might be making millions of dollars. While you are sitting, I suggest that molten cake. Go to the gym, eat a salad at home, then go to Morton's and get that cake. If you are not looking to pick up men, go to Duo. This iPhone picture does not capture the beauty of Duo's artfully composed plate of a molten chocolate cake, a big round chunk of hazelnut mousse, a macaroon with strawberry frosting, and a curl of strawberry sorbet. After you have it, you'll no longer settle for a chocolate cookie at Panera, or even their fancy brownies. Forget it. Just forget it, do yourself a favor, and save your chocolate calories for something meaningful. I no longer care about candy bars, because I have seen the light. I went to Plateau last Thursday for dinner. Plateua is the Thai sibling of Euro-Japanese Duo. During dinner, I absentmindedly ate a spring roll appetizer, and my mind was only half on my salmon entree. I was thinking about Duo's dessert. When the meal ended, I tried to sound casual: "So, we should go next door and get that chocolate dessert at Duo." Most of my dining companions had to go home- one rises at 5:15 to catch the train, and another lives in Norwalk and takes the train. I was left with two mostly willing companions. I rustled them next door after I made it clear that I would not be sharing my dessert. We sat at the bar. My husband ordered Bailey's on the rocks, my friend got a (whole entire) bottle of the sweet saki, and I got the chocolate dessert. ***YAAHHHHHHHHH***! Again, unbelievable. I also had a very good glass of pinot noir, but I have to say, I think it distracted me from the dessert. When you get the CD for the first time, save the alcohol until later. 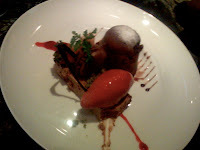 Duo is a great place to go later in the evening for drinks and dessert with a date. Previously, only the Greenwich Hyatt met the "drinks and dessert in a quiet and somewhat romantic" standards. Now, we have Duo. Take that, Hyatt!! !